Have you ever walked into a room and just smiled? These whimsical framed embroidery pictures will make you do just that. 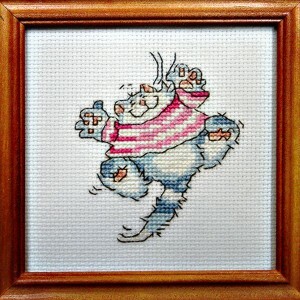 These cross stitched critters will add a fanciful and colourful piece to any room or decor. The art of cross stitch has no origin that we can trace, it seems to go back to the beginning of civilization. A newer trend, ribbon embroidery, makes beautiful pictures. The framed ribbon picture is gorgeous with it’s bright colors and 3D design. Embroidery has the potential to turn even the dullest of rooms into an elegant and artistic place to sit. Your Crafts Fair prides itself on offering a truly unique service that covers everything from more childish drawings to brighten up a kids bedroom to more artistic pieces that create something a little more puzzling for the viewer. If you want to move away from the traditional art that people prefer, then these embroidery pictures could be the best thing for that! We work with a skilled embroidery team who have creative hands and minds to develop photos that show true bombastic images that are fit to bring any room back to life. We love to add dynamism and character to our pictures, as it can help a room transform completely. If you are looking for this type of artistic development within your home, or you need the perfect gift for a friend, then these framed embroidery pictures will be ideal.